BK Tyres’ mobile tyre fitting service operates throughout Berkshire. Mobile tyre fitting is the convenient alternative to taking your car to the garage! 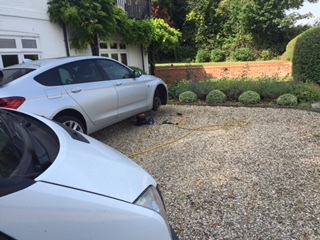 Our trained tyre fitters come direct to your home, place of work, or other convenient location – and that means no hassle and time lost from your day. With our premier mobile fitting equipment, we can exchange or fit tyres just as professionally as at our main premises. Praise for our professional and polite mobile tyre team keeps rolling in – just scroll through our customer testimonials to see what we mean! Did you know that our mobile tyre fitting service doesn’t just cover Berkshire? We also operate throughout the whole of Buckinghamshire and Oxfordshire. Call us on 01491 835353 (or 03331 234242 from a mobile). When it comes to getting new tyres, you can’t always plan ahead. That’s why, for urgent needs, BK Tyres can offer a same day mobile tyre fitting service. It might be that your tyres were in a worse state than you realised, and the car’s failed the MOT. Or maybe you hit that huge pothole on the way home and the tyre is flat. Or maybe you need a winter tyre fast. Our same day service is for times like these. If we have the staff and tyres available, we’ll be happy to help. Prices may need to vary from our regular ones, but we will make this clear on booking. For enquiries, please get in touch. Deflated in Donnington? Blow-out in Basingstoke? If you get a puncture we might be able to get it repaired for a fraction of the cost of a new tyre. Our tyre fitters will always try and repair the tyre to save you money. For just £36.00 we will get you safely on your way by either repairing the puncture or by putting on your spare wheel. All our mobile fitting vans are equipped with puncture repair facilities, and punctures are repaired to BSAU 159 standard. Please note: some vehicles do not have a spare tyre. In this case we will ask you for the size, so we can bring a tyre with us just in case it is not repairable. If you have purchased your tyres from another source and require them fitted please call us to discuss. Call to book any of these services on 01491 835353 (or 03331 234242 from a mobile). Caravan and motorhome tyres are often left standing for long periods of time. hat means that regardless of mileage, they can deteriorate badly over time. If your tyres are due for a replacement, we can supply a full range of options. Don’t forget, we come to you.